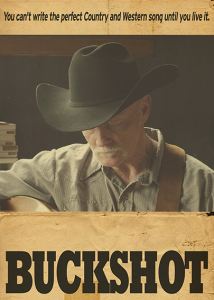 Buckshot is a dark comedy that follows Charlie Stillman, a struggling country singer from New Jersey, who journeys to Nashville to follow in his father's footsteps of becoming a country star. But when his father's checkered past derails his chances, his only job offer is to drive Buckshot Thomas, an aging, hard-living, honky tonk legend, cross-country to his final concert. Along the way, the two men forge a rare friendship, which could change both their lives forever.